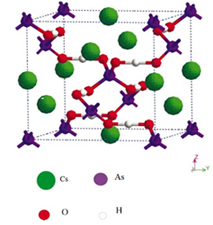 We have carried out first-principles calculations using density functional theory (DFT) and estimated electronic structure, optical properties and phase instability of tetragonal cesium dihydrogen arsenate (CDA). The valence band structure obtained from calculations suggests that the top and middle of VB band are mainly due to 2p states of oxygen and 5p states of cesium respectively. Born effective charges Z* of different atoms in CDA have been evaluated and it is found that the Z* values are larger than their nominal ionic charges. This clearly suggests tendency towards long range ionic interactions which lead to ferroelectricity. The negative phonon frequencies (B2 and E) obtained in our density functional perturbation theory (DFPT) calculation reveal instability of the tetragonal CDA. The Raman frequencies obtained from DFPT calculations are found to be in very good agreement with experimental data. The calculations made considering the pressure effect on CDA show the absence of these modes which confirms the vanishing proton tunneling in the KDP like systems.